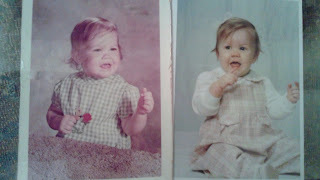 My baby picture (on the left - in case you can't tell from the coloring of the photo!) and Min's. I remind her often that she's lucky that she gets to be cute because her mom doesn't insist on cutting her hair the same length as her brothers'. (scarred for life!) Only time will tell if Mini follows in her mother's footsteps and is required to serve more dreaded detentions. Like Mini, I managed to stay out of trouble in grade school. I was very quiet - on the shy side even. 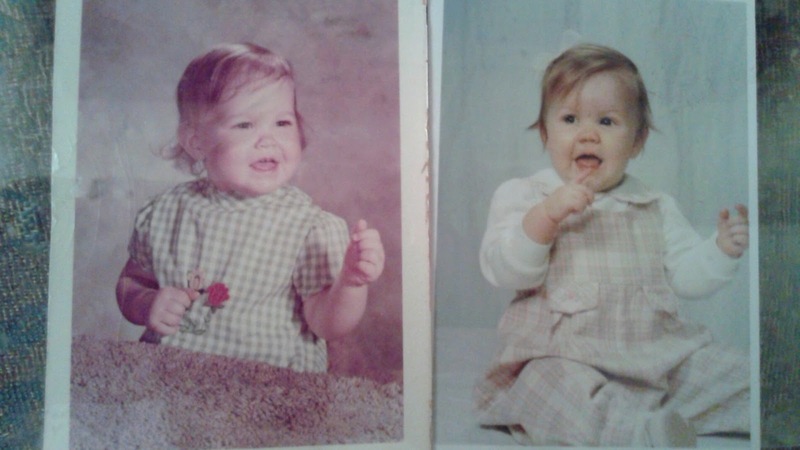 Basically, friends that know me now would not have recognized the younger version of myself. Mini crumbled last week when she was assigned a detention. I suppose I might have reacted similarly if I had to face the music of breaking a rule in grade school. By high school though, I embraced my rebellious side and occasionally had to deal with the consequences. My parents were quite strict. For the first two and a half years of high school, I didn't give them cause for concern. For the most part, my girlfriends and I considered a night with a rented movie, snacks, and the good company of each other a fun time. We didn't break rules, didn't date (not for lack of interest), and didn't get bad grades. I babysat so frequently, that my social life was barely existent anyway. Things shifted a bit by the time I was a senior. I began to rebel a bit against my folks. I was a good-girl after all. The grounding I endured for attending a party when I didn't drink, essentially drove me to drink. Once I got a taste of how the other half lived, I began to throw caution to the wind. My first infraction at school seemed silly to me. I was required to makeup keyboarding assignments because I had missed a few days of class while I was leading a school organized retreat. My fellow retreat leaders and I hated to miss our lunch period to practice our typing skills. It was the only social time of our day! The exercises couldn't be made up at home. It had to be done at school. I felt like maybe the administration could have asked the typing teacher to excuse our typing homework, since we were away on a school sponsored retreat. Despite just returning from retreat, we didn't have a prayer of getting away with the plan that we hatched. We were clueless. We met during lunch and decided that by splitting up the work we would only have to sacrifice that one lunch period. Each of us chose a typing assignment. By printing out multiple copies of each typed paragraph, we could complete the assignments in a fraction of the time. Since we failed to take into account the fact that we were still learning to type, we got busted. Our teacher called us to her classroom the next day. The three of us had turned in our assignments with exactly the same typos. Oops. Cheating. They called our sharing of typing exercises cheating. We each received an automatic level. The level came with a detention, or jug. Jug stood for 'justice under God.' There was a numeric equation for the number of jugs that would equal a level. If you reached a certain number of levels, you would be expelled from school. I had managed to bypass ever serving a detention and jumped right up to level 1. I knew that with 10 available levels, reaching my first level in the fall of my senior year was not a big deal. I was a far cry from a trouble maker. I didn't expect to get another level for the rest of my senior year. The only problem was that a letter would be sent home in conjunction with receiving a level. For the next few weeks, I drove home during my lunch period to intercept the mail. My mom was a school teacher. She would typically beat me home and get to the mailbox after school. Seniors had permission to leave campus for lunch. I drove the most conspicuous car in town. A 1976 red Chevy Impala station wagon. My dad had tried to patch the rust spots, but that only made it more of an eye soar. I still can't believe that a neighbor didn't rat on me and tell my folks that I kept showing up at home during lunch. I didn't take any chances. I lit a match and burned that letter when it finally arrived. It didn't end there . . . (tune in soon to be filled in on my next infraction). I can't be the only goody-goody turned naughty kid out there. Do you have any high school detentions that were earned in an interesting way? Please share in my comments!